Accounts receivable is money that is owed to you by your customers for products or services that you have sold to them. Wouldn’t it be great if all of your customers paid you in cash as soon as they placed an order? Unfortunately, most businesses—including mine—don’t work that way. Instead, we send invoices to our customers with things like “net-30” printed on the top, meaning that we hope our customers pay us within 30 days of getting the bill. And, we all know that doesn’t always happen. Like most businesses, you might have some dead-beat customers and others that just take their time getting their payments to you. This is where accounts receivable comes in, also known by the shorthand “AR.” Accounts receivable is the amount of money that your customers currently owe you for things that you have already sold to them. Essentially, it’s a total of all of the invoices that you have given to customers but that have not been paid yet. In your company’s financial statements, accounts receivable will show up on your balance sheet as an asset. You might also get additional reports from your accounting system (or right in LivePlan if you use the Dashboard feature) that tell you the average amount of time it takes your customers to pay you—AR days—and which customers owe you and how past due they are. 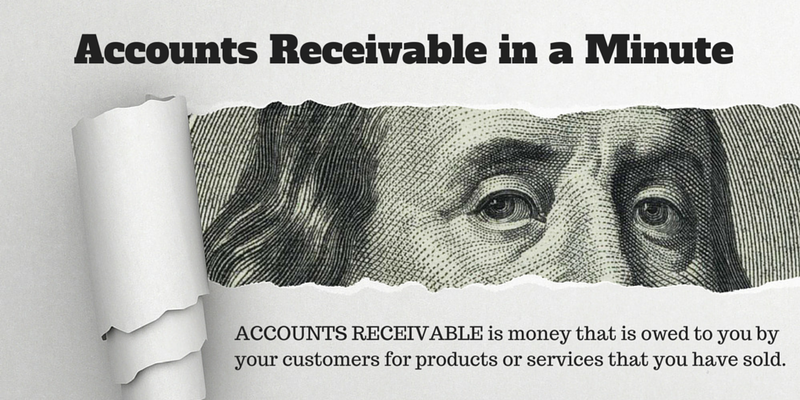 Why is accounts receivable important? Tracking your accounts receivable is crucial to managing your cash flow. While your sales might be going well, if your accounts receivable continues to grow and your customers aren’t paying you fast enough, you could find yourself in a cash crunch. This is a classic example of why fast growth can actually be challenging for small companies. While you’re making sales and delivering your product, if you aren’t getting paid fast enough, you may have trouble fulfilling orders in the future or even paying basic business expenses because you don’t have the cash in the bank. Tracking accounts receivable is critical to staying on top of the situation so that you can make sure to collect the money that is owed to you. You should track not only the total accounts receivable number (how much all of your customers combined owe you), but who owes you and which customers are behind on their payments. With this knowledge, you can decide which customers to chase down for payment and keep your bank account full. What’s better? Higher or lower accounts receivable? In general, having a lower accounts receivable balance is better. This means that your customers are paying you quickly and that you aren’t owed that much money. That said, if your company is growing, you may see your accounts receivable balance grow over time as you get more customers and sell more to those customers. If this is the case, you’ll want to track what’s called accounts receivable turnover ratio to make sure the percentage of accounts receivable compared to your sales remains fairly constant. We’ll review this ratio in more detail in this post, but in the meantime, you can track this ratio as you grow to make sure that accounts receivable isn’t increasing faster than your sales are. Offer your customers a discount for paying faster. If you want your customers to pay you faster, you might just need to give them an incentive. After all, by letting your customers pay on their own schedule, you’re effectively giving them an interest-free loan. Instead, encourage them to pay faster by offering a discount for early payment. Penalize customers that don’t pay on time. Maybe not as friendly as a discount for early payment, customers that don’t pay on time might need to pay a penalty—usually a percentage of the invoice total. These penalties can help ensure that customers pay on time. Consider accounts receivable financing. Also known as factoring, accounts receivable financing can be a great way to improve cash flow. Essentially, once you issue an invoice, you transfer that invoice to a factoring company. They will pay you 80 to 90 percent of the invoice in cash so you don’t have to wait for your customer to pay you. Your customer then pays the factoring company who then pays you the remaining portion of the invoice, minus a service fee. Establish a business line of credit. An alternative to factoring is to establish a line of credit for your business. You can draw on this line of credit while you wait to get paid from your customers. You’ll pay your bank interest for the money that you have borrowed from your line of credit and potentially some additional fees to keep your line of credit open. Use a collection service to collect for you. Instead of spending your time chasing down customers and requesting payment, you can outsource collections for your accounts receivable. These services don’t loan you any money. Instead, they reach out to customers and remind them of overdue payments. They often collect a fee for successful payments, so you probably only want to use a service like this with problem customers. Tracking accounts receivable is one of the critical components to managing your company cash flow well. You’ll want to know how much you’re owed, who owes you, and which customers need to be followed up with. With the right strategies for managing accounts receivable, you’ll keep a solid cash position which is crucial for any growing company. For more business and financial concepts made simple, check out these articles on direct costs, cash burn rate, net profit, operating margin, accounts payable, cash flow, profit and loss statement, balance sheet, and expense budgeting. Editor’s note: This article was originally published in 2014. It was revised in 2018.